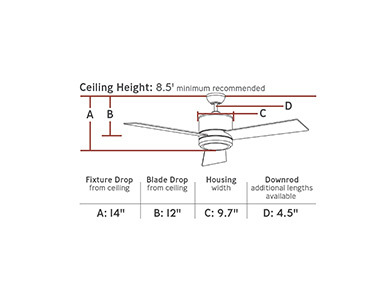 Similar to the popular Clarity hugger ceiling fan series, the 56” Vision Max by Monte Carlo is sleek and modern, but comes with a downrod to bring the fan down into the room when ceiling space allows. It’s offered in three finish combinations to suite virtually any décor requirement. Damp-rated for indoor/outdoor use, the Vision Max also comes with a four-speed wall control with LED dimmer. Details: A Finishing Cap is included if the light kit is unnecessary. Includes Wall Remote with downlight.